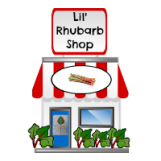 If you are looking for a rhubarb pie recipe with both eye and palate appeal, you have found the best one here! This homemade pie makes quite the show as a dessert finale to any supper! Yesterday I made this rhubarb pie, and I changed the recipe, and it took me less than ten minutes to make! Scroll down to See how I changed this recipe using a can of cherry pie filling. In a large bowl, combine the chopped rhubarb, pitted cherries, granulated sugar, tapioca, and the red food colouring, if desired. Allow the mixture to stand for about 15 minutes. Line a 9" pie plate with the pastry, and add the pie filling mixture. If desired, brush the beaten egg on the pie crust edges. Top with the pie pastry dough, and cut out several "vents"/slits in the upper crust, or top with a lattice style crust. Flute the edges, and, if desired brush the top of the pie crust with the beaten egg. Note - applying beaten egg to the pie crust helps to seal the juices in the pie, and adds a golden colour to the pie when it is fully baked. This is optional. Bake the pie at 400° F for about 40 - 50 minutes, or until the crust is golden and the fruit begins to bubble through the "vents". 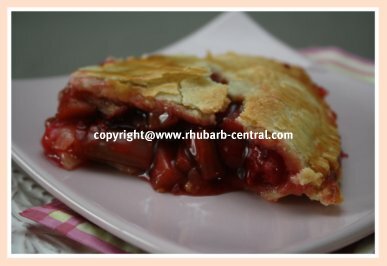 Serve this rhubarb cherry pie warm or cold with ice cream, whipped cream, or dessert topping...ENJOY! 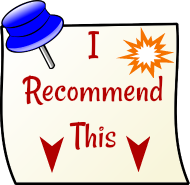 - only 1/8 cup quick-cooking tapioca (or use scant 1/4 cup flour). 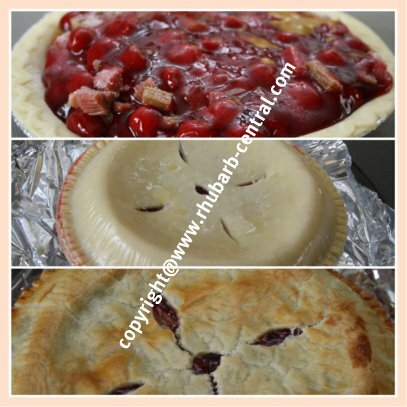 I also used a package of 2 - store purchased pie pastry crusts, and, beginning with the tapioca (or flour), alternated adding the tapioca, rhubarb, sugar, and the cherry pie filling to the bottom crust (2 times). Then I brushed the beaten egg on the edges, added the second pie crust, fluted the edges, made vents, brushed the top crust with the beaten egg and ... presto ... Done. Delicious. Delectable! Making a Yummy Rhubarb Cherry Pie Recipe! Do you ever have problems with the edges of your pie pastry crust becoming too dark when baking in the oven? I used to have this problem but since I have purchased a pie crust shield / protector, this is no longer an issue. 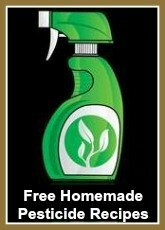 I highly recommend this product, especially if you bake a lot of pie, or if you purchased pies ready-made that you still need to bake in the oven.